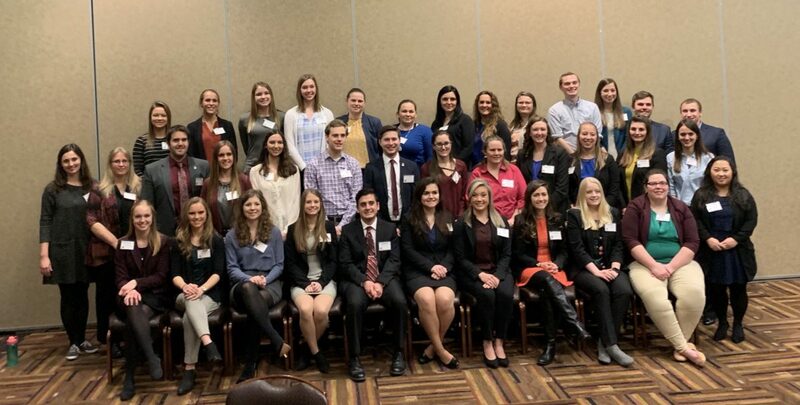 Students from across Wisconsin, studying various health fields, earned cash prizes for winning first, second and third place at the sixth annual statewide healthcare case competition organized by Wisconsin AHEC (Area Health Education Centers) on Friday, January 11, 2019. Taking first place and a $3,000 cash prize, representing Northwest AHEC, were Wisconsin Indianhead Technical College-New Richmond students: Allison Mork (Associate Degree Nurse), Cerrita Houston (Associate Degree Nurse), Gina Henton (Spanish & Nursing), Kimberly Schadt (Associate Degree Nurse), Sophia Lucas (Associate Degree Nurse, Supervisory Management) and Cheryl Moore (Advisor). Taking second place and a $2,000 cash prize, representing Northeastern AHEC, were team members: Megan Huss (UW-Green Bay, Registered Dietitian), Sarah Bedford (UW-Green Bay, Registered Dietitian), Kari Pritzl (Fox Valley Technical College, Occupational Therapy Assistant) and Laura Reynebeau (UW-Green Bay, Human Biology/Nutritional Science). Taking third place and a $1,000 cash prize, representing Milwaukee AHEC were, Carroll University students: Ashley Labodda (Biochemistry/Pre-Med), Kate Gentry (Biology/Pre-PA), Rachel Noonan (Biology/Pre-PT), Samantha Penzkowski (Nursing), Alissa Bruening (Exercise Science) and Devanshi Patel (Advisor). From 19 team applicants, nine finalist teams chosen and competed in the event. The teams were made up of students from private and public universities and colleges across the state, with each of the seven Wisconsin AHEC regions represented. The students were assigned a case study of a complicated situation, and worked together for two months to conduct an analysis of the efforts and opportunities at the hospital and within the community. The team then traveled to the Wisconsin Dells to present their findings and recommendations for enhanced interprofessional collaboration. On the competition day, each team presented its findings and recommendations for collaboration to a panel of judges. The panel of judges consisted of leaders from multiple disciplines within Wisconsin’s healthcare community: R. Shelly Lancaster, Assistant Dean/Director of Pre-Licensure Programs for the University of Wisconsin Oshkosh; Kristin Stearns, Executive Director of LakeShore Community Health Centers; Roger Rego, Finance Director of Bridge Community Health Clinic; Josh Bench, Coordinator of Pre-Health Student Resource Center at the University of Wisconsin-La Crosse; and Andrea M. Spagnoli, Master of Public Health Student, Program Coordinator at Fostering Futures and AHEC Alumni Board member.